A brilliant combination of a folding rucksack and a bumbag! 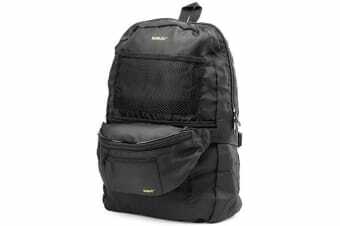 Ideal for all travelling adventures, this Korjo Foldaway Rucksack features lockable compartments, reinforced stitching, webbed pouches for drinks as well as more storage space! For easy and convenient space saving, the rucksack folds down and fits inside the bumbag to avoid unnecessary mess and luggage usage whilst on holidays!